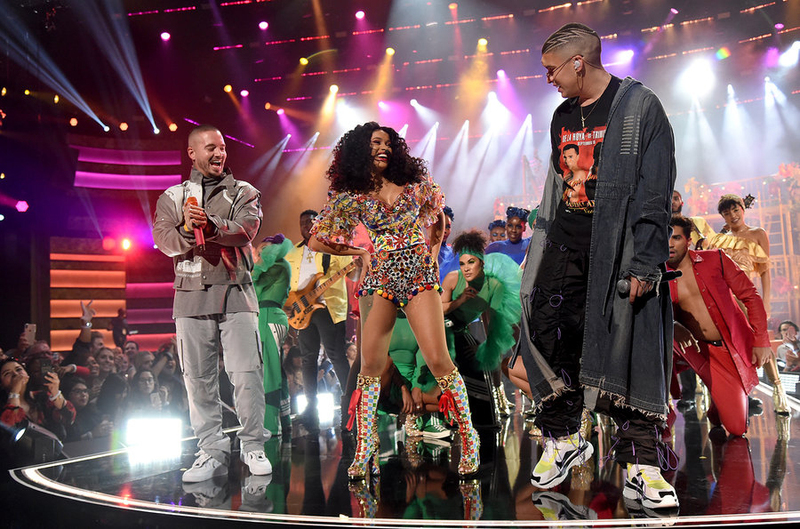 The American Music Awards are often described as the world’s largest fan-voted awards show. Held annually in Los Angeles, this televised event spotlights artists across many genres, from pop to alt-rock, country to adult contemporary, rap to soul, hip-hop to EDM, and soundtrack, and so on and so on. Not one to shy away from making a statement, the evening’s host Tracee Ellis Ross (who is styled by award-winning Powell River-born Karla Welch) chose to make her fashion ‘statement’ by wearing only African-American designers. While the AMA’s red carpet may not be as elegant and awe-inspiring as the Oscars, it did provide a backdrop for our favourite music creators to show-off their style. 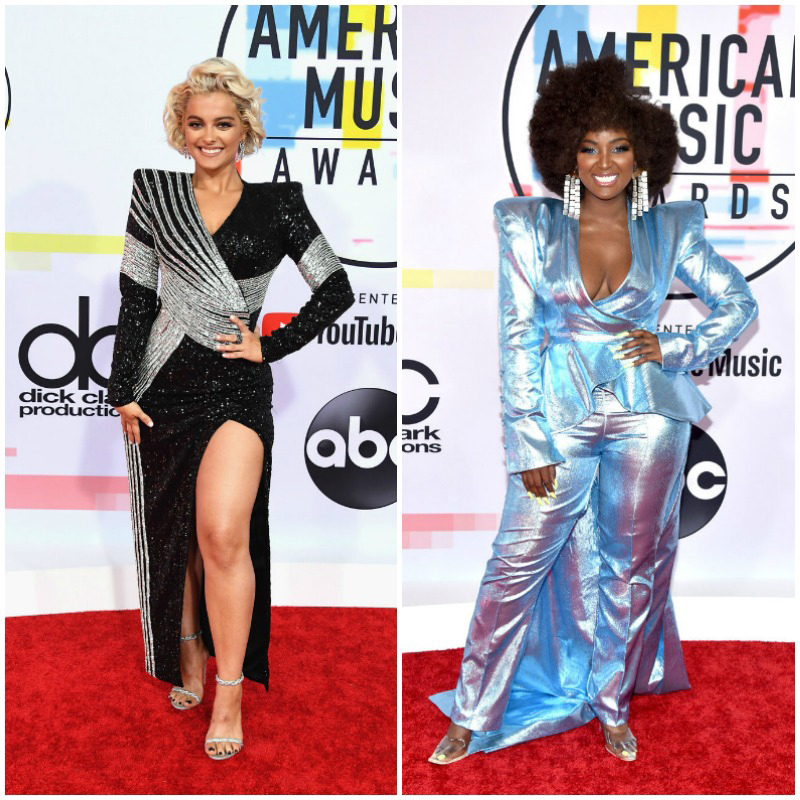 Four Themes from the AMAs that Showcase The 80s! If you caught yourself humming Madonna’s ‘Express Yourself’ after watching the AMA’s, no one would fault you. The oversized silhouettes, pastel colours, padded shoulders, and diagonal cut-lines, all conjure up fond memories of the 1980s. 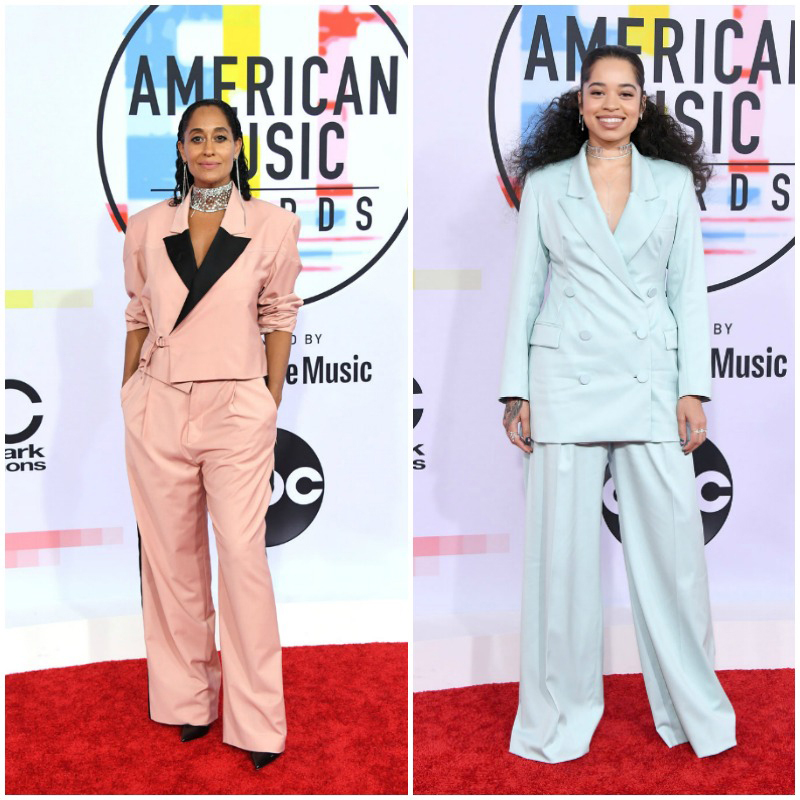 Host Tracee Ellis Ross did ten outfits changes but it was this light pink bell-boy suit with black velvet lapel detail by Kerby Jean-Raymond for his Pyer Moss label, which caught our eye. Soul singer Ella Mai rolled in like a 1930s gangster in the palest sky blue boxy double-breasted suit that made us want to sing ‘Express Yourself’ by Madonna. So wonderfully Gaultier. For suiting that is suitable for the office or a night out, check Turnabout for Piazza Sempione, Missoni, and Sonia Rykiel. 1980s power suits pale in comparison to 2018s versions. Luxury design house Balmain created cross-over artist Bebe Rexha’s sleek sequined high-slit dress and capsule-collection designers TLR ‘The Love of Retro’ win the award for incorporating the most 80s elements into one ensemble. Like Latin pop singer Amara la Negra from VH1s Love and Hip Hop, we love a good peplum! To add glitz and glamour to your holiday looks, seek out Saint Laurent, Givenchy, Dior, and Roberto Cavalli at Turnabout locations. Designer Sonia Rykiel is a favourite of Gossip Girl’s Leighton Meester. The actor has been wearing Rykiel on red carpets for over 10 years – a love affair that we hope never ends. This end-of-era disco look is just stunning in its simplicity. To up your glamour level a few notches, look for Roberto Cavalli, Bebe, and Nicole Miller at Turnabout. Lebanese designer Georges Chakra created this hot pink deep v-neck dress with thigh-high slit for the amazing Jennifer Lopez. If there ever was superstar to wear this colour and that plunge it is superstar JLo. Beyoncé protégés R&B singing sisters Chloe x Halle continued their strong red carpet game in these enveloping Valentino gowns in the loveliest pastels. To add this draped drama to your wardrobe, look for Valentino, Theory, and BCBG Max Azria at Turnabout. Whether you are surprised, excited, or sobbing, there is no denying that the 1980s are back in a big way this season. Look for shoulder pads, oversized blazers, ruffles, sequins, and ‘door knocker’ earrings when consignment shopping, to capture the essence of a truly awesome decade.